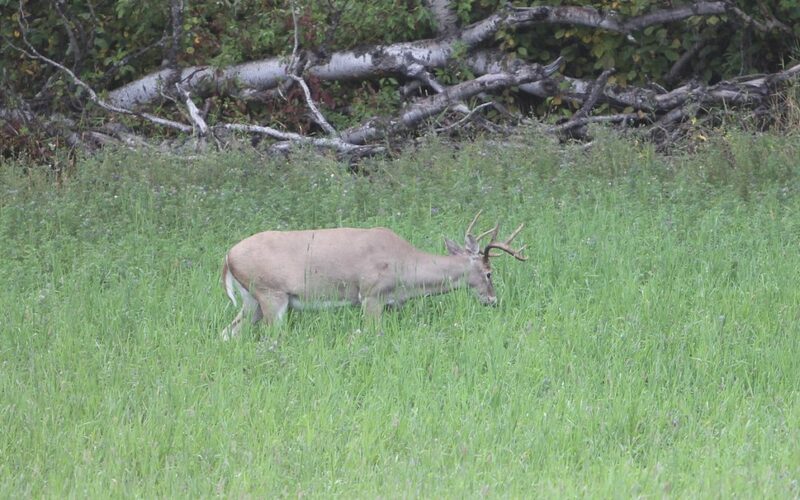 A mature buck’s survival ability is incredible enough, but the big 10 is just plain lucky as well. In fact, his name is not longer Big 10, it’s now Lucky. I was in the right place at the right time but he just got lucky. From the stand, I can see an opening about 60 yards back in the woods, and the trail that leads under my stand goes through that opening, so I spend a lot of time concentrating my attention looking at that opening because it offers me an advance warning that a deer is coming. The trail then reappears at the edge of a small slough 40 yards away. Once the deer walk across that small slough, they are screened by low-hanging spruce boughs until they are with 10 yards of the stand. I went out with the most confidence I had on this entire hunt last night that the buck was going to use this trail. Sure enough, about 6:45, I looked into that opening and there he stood. When he advanced, I stood up, got my camera rolling and was about to get my bow off the hanger when he appeared at the edge of the little slough and looked down the trail right towards me. I was frozen in place. 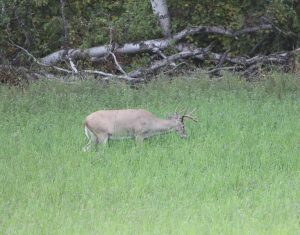 He stood there staring in my direction, occasionally looking around, but mostly staring down the trail towards the opening to the field just below me. I watched the camera roll as the minutes ticked off. By six minutes, my legs were starting to ache from being frozen in place. At eight minutes, I had to move my hand a few inches to rest it on a limb. He stood there motionless, staring for nine and a half minutes before he took a step. I knew as soon as he took a couple more steps I would have to make a move for my bow and get ready when he went behind those low-hanging spruce limbs. Two more steps and he was hidden for a moment so I made my move. I grabbed my bow off the hanger and turned my body into position for the shot that was about to come. When I did that, the field behind me exploded with does running, flagging and snorting everywhere. I had no idea they were there, or how long they had been there. They had fed out into the field right behind me during the ten minutes I had been concentrating on the buck and been frozen in place. The buck melted back into the bush. I sank back into my seat knowing that my best chance to shoot that buck was gone and probably my entire hunt for him was over in that heartbreaking moment. He had won the chess match, with the help of five does who almost certainly saved his life. It’s Friday and I have to go home Sunday with or without a deer. I’m going to have a talk with Tom this morning and decide if I should try for Lucky one more day or if I should go set up on the heavy 10 and spend my last two evenings trying to get him. He knows these deer and their habits really well so I want to chat with him about it before I make a decision. Incredibly, the bladed 8 showed up on camera again last night after going AWOL for three days and he is still in velvet. But he is too inconsistent in his movements to target at this point.